Amazing to think that almost 2 years ago, I created my first Hacked Planner from a pocket sized, 192-page, ruled Moleskine notebook. Better yet, I'm still using a hacked Moleskine planner (my 4th) to manage my personal life. Still Surprisingly Popular— The hacked Moleskine book photo, with it's myriad hover notes is the most popular image of my Flickr collection, currently at 53,484 views, with and 344 people calling it a favorite. The post on my blog is regularly the highest hit page of my site, which after nearly 2 years amazes me. 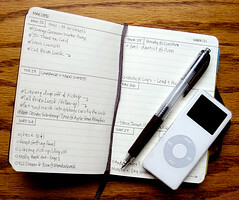 It would seem logical that creating a custom planner to suit your own needs is striking a chord with people on the net. Customized to My Needs — I've loved having a planner I can tailor to my needs, even if they change. Pre-printed planners and calendars are OK, but If I need more note pages, I can't add them. If I prefer a different schedule view that fits how I work — out of luck. With a custom, hand-drawn planner, I'm the boss. It takes a little work to create, but the complete control and flexibility it offers is worth the initial effort. I Write & Sketch More — Having free pages in the back of the book encourages me to write my thoughts, capture ideas and important info, and sketch things I see or are on my mind. Always having paper and pen makes this possible and pleasurable. Makes a Great Carrying Case — Carrying a Moleskine allows me to keep business cards, coffee cards and other tidbits in the back pocket, so they're handy when I need them. The pocket works great for carrying a backup $20 bill along. Works Well with Index Cards & Sticky Notes — The pocket sized book works very well with both index cards and sticky notes. I now put my task lists on sticky notes and place them in a tasks area, so they can be easily updated. I can also place sticky notes on the cover of the planner. I can also carry index cards along as needed. Overall, the experience of moving to a paper-based, custom planner has been very positive. Of course there are some things missing, like a full list of contacts and alarms. However, my iPod touch handles the alarms, and provides access to my contacts (not to mention email and web access with WiFi). Give the Planner Hack a Try! 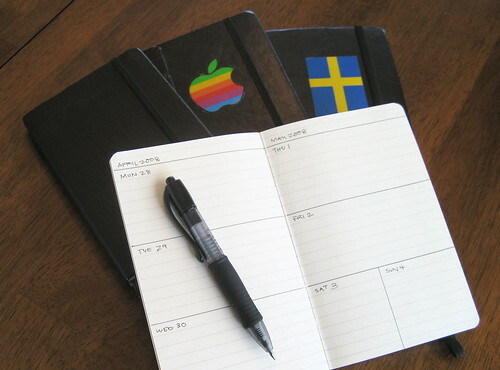 If you're on the fence about creating your own Moleskine Planner Hack, why not pick up a Moleskine and give it a try? Visit my dedicated site PlannerHack.com for more details on the hack, and links to other hacks available. Hi Mike! I just love your blog! Love your planner idea even more! Sorry if you've answered this question before, but do you just have one month per Moleskine? Also, what do you have on your tabs? Thanks for the posts and ideas! Keep up the great work! I love your blog and I have been converted to the Moleskine, although I can't stop calling it the Moleskin. I'm not as organized as you are with it but I have seen a definate increase in productivity with the simply to-do lists.I love being able to sketch to fill in the empty space in past pages. Hey Mike! I think I figured it out. 4 books, 2 years = 6 months each. :) but the tabs ... ? How are you liking the iPod Touch? Do you miss it not being an iPhone, or is your hatred for AT&T enough to overlook your iPod not being the "Jesusphone"? @Laurie, you guessed right -- each book covers about 6 months. I am trying 8 months with the latest, going May through December, we'll see how it works out. As for the tabs, they mark out sections for tasks, notes and a section I have for important phone numbers. @macfixer, The iPod touch is working out great! I chose it because of the $50/mo fee an iPhone requires, and because I like having a separate, cheap Nokia for voice calls. Better batery life, if I lose it it's cheap to replace and it's really tough. I like your Planner Hack. I used it for the last half of 2007. I started this year with a Filofax so that I could get everything into one place but find it to be bigger than I want to carry. Have you considered using one of the address book inserts that come with the Moleskine planners for your important numbers? That way, you would not have to rewrite the numbers every six months. Joe, glad to hear the hack worked for you earlier this year. And yep, size is great with the Moleskine, pocketable would be my term. I first came across your Moleskine planner on Flickr. I had seen a Moleskine notebook used by a stranger on the train and immediately though - that looks cool. The google and flickr searches lead me to your site and now I use a very similar planner to your version. I agree with other comments about maintaining a paper contacts/address list, so I use outlook for that which syncs with my Sony Ericsson W880i phone. This slim phone and a pocket Moleskine make for a convenient package. The phone also manages alarms like your iPod does, but I use Google Calendar. Some may say what is the point of a paper based planner and an internet calendar? However, I find that I only put important stuff on Google (which is quite quick) and then their alerts mechanism (free) not only provides a daily agenda email to both my work and home PC, but also email reminders and SMS text messages straight to my phone! To manage this hybrid approach I have adopted a code I call GWH. This comprises of these 3 letters after all appointments in my Moleskine. The G stands for Google Cal, the W for my mandatory Work Planner (so my boss knows where I am) and H for home (so my wife knows where I am!) What I do is as I inform these parties/systems I circle the appropriate letter. Not everyone needs to know everything, so sometimes I just need to cross the letter out. This effectively lets me keep my Moleskine in sync with everything else. I have rambled on a it, but I hope it is of interest. Thanks for the initial inspiration to go back to paper and how to use the Moleskine for it. Craig, I love this idea of marking events for the context! I'm going to give this a try on my new book.